OK so its session time now at Ignite and I have to say I am fairly well excited at the prospect of learning about some of the things that interest me in the IT world of 2015. The first of these interests is the latest incarnation of Windows 10 Mobile. You see I am one of the 4% of people on the planet that have selected not to swallow the Apple and Android pill and use Windows Mobile. Well put it this way I for one am not a fan of the tedium of the Android interface. I find it personally frustrating and unnecessarily layered in how it wants me to interact with it. All the raving by Android users (not to mention the usage statistics globally) does not take away the feeling I have that it’s underwhelming in many ways. Maybe the problem is me, not sure. The Apple OS is OK, I personally find it is much better, smoother and more logical than Android by far. I don’t have any major issues with its layout, apart from it giving me the feeling that it has been coded for billions of giggling teenagers. It seems to work for the most part. But Windows Mobile in my view, is just a nicer way to get information from your phone than either Apple or Android. The Active tile setup is just brilliant for busy people on the go. It really is leaps and bounds ahead of both Apple and Android in this regard. It is not until you have taken it for granted and then someone (my ex employer’s IT department in this case) unceremoniously takes it away from you. They then rudely replace it with an Android phone which sports a silly number of unreadable tiny tiles that tell you nothing. That’s when you realise just how important the instant and digestible the Active tile status changes and information blobs are in Windows Mobile. Also the single swipe to get access to your apps in a cohesive vertical list is a much easier proposition than playing swipe, swipe, swipe, swipe (where the heck is my tiny app tile in this melee of disorganisation?) with Android or Apple. Also I find that the integration into the corporate information mesh is just perfect. My Exchange mail, Hotmail, my remote corporate apps, desktop apps and other corporate business toolsets just seem to work seamlessly for me. So you could guess that my excitement was heading exponential as I waited to see what the new Windows 10 Mobile release was going to provide. Much has been said about Windows 10 Mobile and how it will essentially be on the same platform framework as the desktop version. Which means that application coding can essentially be done once and applied to all Windows based devices, whether desktop, laptop, tablet or phone. That is a big deal from a strategic perspective, as it can drastically reduce the costs required to get applications out to all the different form factor devices. But for me the one of the coolest things I wanted to see and learn about in this session was “Continuum”. This phone feature has a name that reads like a Matt Damon action film title and it essentially sets the stage for you to drive a pc computing experience straight from your phone. Now this concept of running a pc experience from my phone has been my IT equivalent of finding a unicorn for a long, long time. You see, I always wanted a single device for everything. Just one. Over the years I have been getting closer to my desired goal by migrating from desktops to laptops and now to a Microsoft Surface Pro 4 that I use today as a desktop and portable device. It is quite amazing as a tool and is a complete phase shift away from the laptop days of old, but I still have a need to carry my phone. Some days are just amazing and from a single device perspective I can get by solely with my trusty Windows Mobile. With my day to day meetings and any conferences I attend (Ignite! ), I simply enlist the services of my Windows Mobile to take notes in OneNote, work on documents, PowerPoints or spreadsheets as I need to. It is just easy with a single device. This single device mantra of mine has made me somewhat divergent in an industry where many carry fashionable devices in the same way that rappers wear gold chains. So when Microsoft Lumia product manager Jacqueline Lipman took to the stage to deliver the session on Windows 10 Mobile in the Enterprise; she seduced me completely and instantly in her opening by dropping that Matt Damonesque action word “Continuum” and fleshing out what it promised to deliver. Really ?? I can use my phone like my PC?? My PC can be my phone ?? Was I hearing this right??? Wow…cool! Jacquline went on, telling me how I can plug my Windows 10 Mobile into my Windows Mobile dock and my “desktop” comes up on a monitor and I can start using it like a normal PC. She skilfully demonstrated this seamless oscillation between the phone and pc experience which blurred lines with the mastery of Robin Thicke. I was beside myself with excitement. I was already mentally planning the ebay listing to sell my newly acquired Surface Pro 4. Then just as things were moving along rather nicely, Jacqueline shared a secret that broke my heart and shattered my dreams of a device marriage made in heaven. 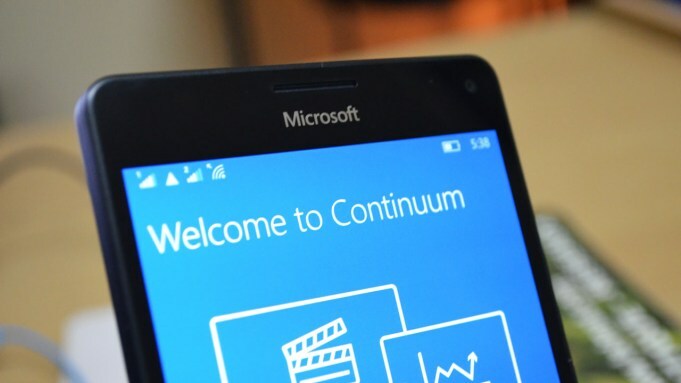 Continuum would only be available for the brand new “Continuum capable” Microsoft Lumia devices. I crashed and burned harder than Tom Cruise did with Kelly McGillis in the fabled Top Gun bathroom scene. Ouch. You see I had just bought myself a brand new Nokia Lumia 830 that would indeed be upgradeable to Windows 10 Mobile upon its release, but it was not of course “Continuum capable”; and as such I had to pull the Surface Pro 4 out of the my mental recycling bin and dust it off. Jokes and shattered dreams aside, the user experience that Continuum offers proved to be extremely useable. It is just a tiny bit short of the snappiness you get when using a full blown PC or tablet, but not by much. It would make an absolutely brilliant companion for someone (like me) who needed just enough PC style power to modify that PowerPoint, Excel spreadsheet or Word document whilst on the go. It was great to see it run off the specially designed Microsoft Mobile Dock that Jacqueline had it hooked up to, complete with monitor display, mouse and keyboard. It really did behave just like a normal PC. As Microsoft Windows Mobile devices get more processing power in due course, it is very easy see how your Windows Phone could indeed be the only device that you would ever use. Grab your phone, stick it in your pocket, take it to work, dock it, run your apps and work all day long (on a desk void of clutter) then at the end of it all, undock it and put it in your pocket again. Imagine your airport travel security screening experience in this new age of “my phone is my pc”; just drop your phone into the blue tray and walk through the screening frame. Easy, no more kafuffle with laptop bags and pulling out massive devices and chargers like it’s the dark ages! Plus, with a cloud enabled platform underpinning this type of “all in one” device you could very well be in a position to experience something surreal. Simple, non-intrusive, ultra light weight, trustworthy and truly portable computing. 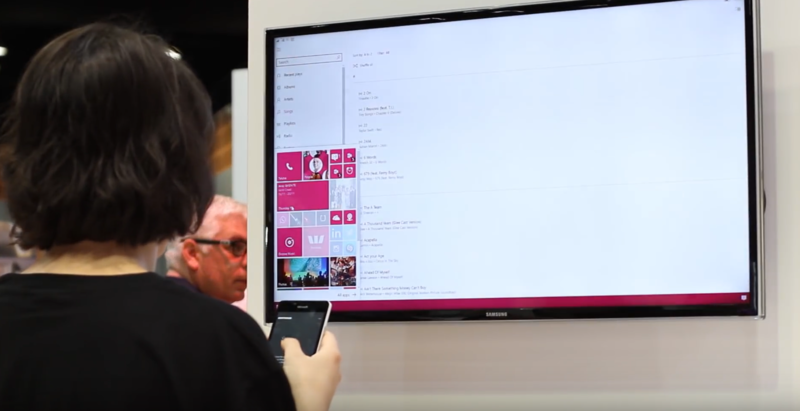 My dream of device singularity may not quite be ready to be realised in the realm of today, but from what I saw from the Microsoft Lumia and Continuum, the technology is ever so close to delivering the ethereal panacea. It was a great session and I can’t wait to see what Jacqueline and the Microsoft team will have in store for us next year. A big thanks goes to Jacqueline Lipman for the great session and for taking the time to answer all my questions at Ignite on Windows 10 Mobile. The Cloud Collective – Partnering redefined ?